Three new polls on the Fiscal Compact treaty referendum are to be published in tomorrow’s papers with results released this evening. SUPPORT FOR A No vote in the Fiscal Compact referendum this Thursday has risen as support for a Yes vote has declined according to one of three new opinion polls to be published tomorrow. The three polls show support for a Yes vote still remains strong but there are a large number of voters who remain undecided with polling less than a week away. The Red C poll for the Sunday Business Post shows that support for a Yes vote is at 49 per cent (down four percentage points) while support for a No vote is at 35 per cent (up four percentage points). Those who are undecided on how they will vote account for 16 per cent of those polled, which is unchanged since the last poll which was published two weeks ago. When undecideds are excluded support for a Yes vote is at 58 per cent while support for a no is at 42 per cent. More than 1,000 voters around the country were polled last Monday, Tuesday and Wednesday. Full analysis of the poll will be published in tomorrow’s Sunday Business Post. It is one of three polls being published in tomorrow’s Sunday newspapers. A Behaviour and Attitudes poll in the Sunday Times shows support for the Yes side at 45 per cent, No voters account for 30 per cent while a quarter – 25 per cent – say they do not know which way they will vote. When the undecideds are excluded support for the Yes side is at 60 per cent compared to 40 per cent for the No vote. Meanwhile, a Lansdowne poll in the Sunday Independent shows support for Yes vote at 42 per cent, with support for a No vote on 28 per cent. Don’t knows account for 31 per cent of those polled. When the undecideds are excluded the Yes vote is ahead with 60 per cent compared to 40 per cent for a No vote. Earlier, an Ipsos MRBI poll in today’s Irish Times showed the Yes vote still leading by 39 to 30 per cent but the number of those who don’t know was at 22 per cent while 9 per cent said they would not vote. Email “Support for Yes side falls in one of three new referendum polls”. 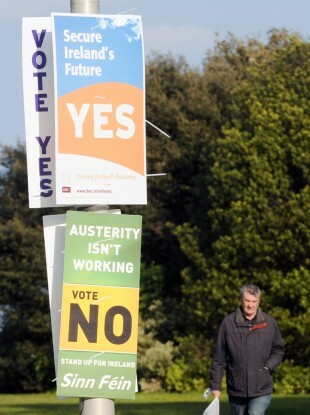 Feedback on “Support for Yes side falls in one of three new referendum polls”.